Raptor sport truck antics, part two. The second-generator Raptor delivers unmatched performance. Give someone a Raptor and their lives are forever changed. 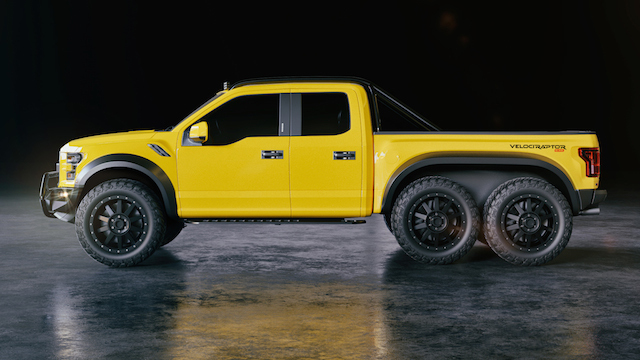 Okay, maybe that’s a bit of an exaggeration, but then the Ford F-150 Raptor isn’t your typical pickup truck. That point was driven home to me last year when a 2017 Raptor showed up. It was big, bulky and badass — four huge doors and a honking footprint and stance to match. This time around Ford delivered a 2018 Raptor SuperCab. Instead of four full-size doors, this one has half-size rear doors hinged at the rear roof pillar. And you know what? I liked the look of the “smaller” Raptor as its proportions seemed just right (it is a foot shorter between the axles). The Raptor isn’t the most expensive model in the F-150 line — the King Ranch, Platinum and Limited are priced higher. But it is the only one of seven F-150 trims with Ford Performance craftsmanship. This means the Raptor along with the Fiesta ST, Focus ST/RS, Mustang Shelby GT350 and the GT supercar are in special company. We’ll see what Ford does when the Fiesta and Focus go away next year, although we do know an Edge ST model is waiting in the wings. Two cab sizes are available: SuperCab (pictured) or SuperCrew. 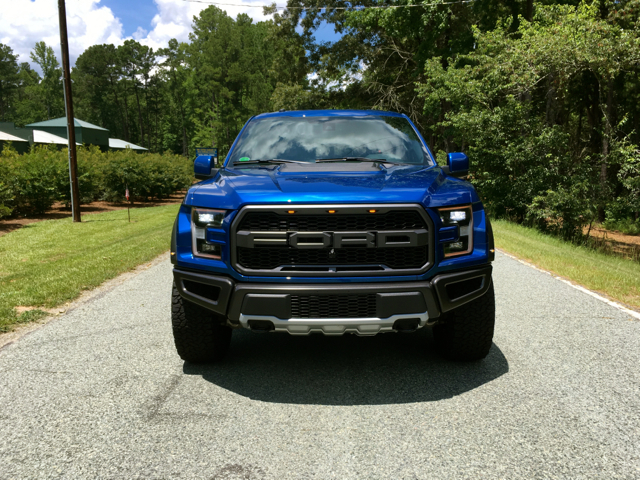 The Raptor’s stance is formidable, but even before you gaze over its handsome body, you’ll take in its massive grille. That front fascia has unique FORD block letters and integrated marker lights. When the Raptor pulls up behind another vehicle, its presence is certainly intimidating. Make it all the more so by keeping the headlights on during the day as I often did! You may remember that the previous Raptor (2010-2014) offered two V8 engine choices with 5.4- and 6.2-liter displacements. The larger of the two banged out 411 horsepower and 434 pound-feet of torque. Both were paired with a six-speed automatic transmission. For the latest Raptor (2017 on), Ford started from scratch, delivering an all-new powertrain. 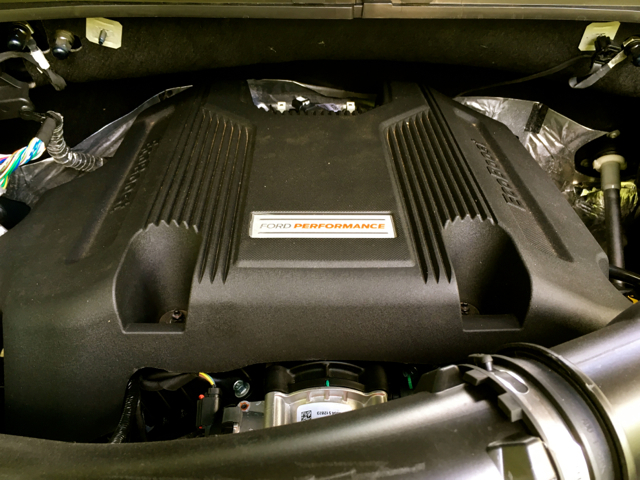 Under the hood is a high-output 3.5-liter twin-turbo V6 engine. No, it isn’t the same EcoBoost engine found in other Ford products, instead Ford developed a new one with twin direct and port-fuel injection, a redesigned twin-turbocharger system and other power-enhancing modifications. The result is an astounding 450 horsepower and 510 pound-feet of torque with a new 10-speed automatic transmission sending power to the wheels. Hold on and shut up! 3. Road and dirt ready. Develop a sport pickup truck and you better make it dominant on and off-road. For the Raptor, it doesn’t matter what surface you have in mind — it is just as suitable on the road as it is off. Helping matters, of course, is its standard four-wheel-drive system. The ground clearance is 9.9 inches versus 9.3 inches for the other 4×4 trucks. It also comes with Fox Racing shocks, designed to provide smooth rides on road, while preventing the Raptor from bottoming out off-road. Without them, the Raptor wouldn’t be the King of the Road and Off-Road. 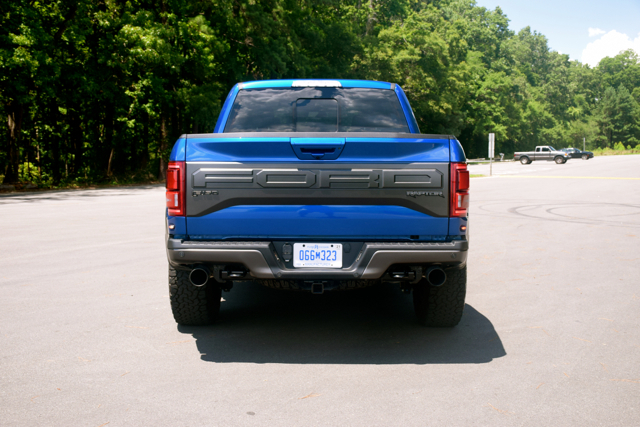 Protecting the Raptor’s fully boxed frame you’ll find heavy-duty front and engine skid plates. The standard cast aluminum running boards make it easy to get in and out. This truck rides on 315/70 R17 BFGoodrich All-Terrain T/A KO2 tires and is dressed in cast aluminum wheels. Other features include manual folding side mirrors, a power locking tailgate and four tow hooks — two in the front and another two in the back. Not only does the Raptor thrive off-road, but it gives you a six-mode terrain management system. On the road, you’ll leave it in normal, switching to sport when you want a more aggressive drive. The wet/snow mode is ideal when conditions warrant it, while mud/sand will ensure that you don’t become stuck. Rock crawl will take you up and down the toughest terrain. We’ve counted five modes so far. So, what is the sixth? That’s none other than Baja — what mimics the conditions of the Baja 1000, the world’s greatest off-road race. This mode is designed for high-speed desert racing for more linear power and improved engine response. The transmission shifts faster, but it also holds gears longer in rev range. Thus, the Baja mode isn’t just for racing, it is for winning! 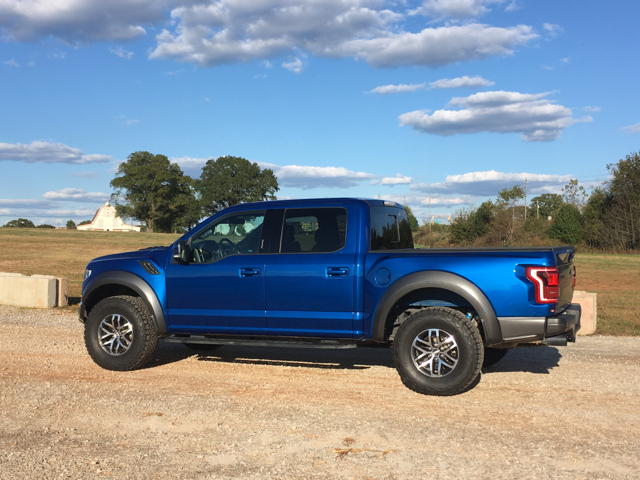 The F-150 King Ranch, Platinum and Limited may have a leg up on the Raptor and other models when it comes to premium features, but that doesn’t mean the Raptor is devoid of creature comforts. Yes, cloth seats are the standard here, but the look and feel is upscale. Besides, leather would take a pounding by Baja-loving drivers. You need something that is washable and highly durable. 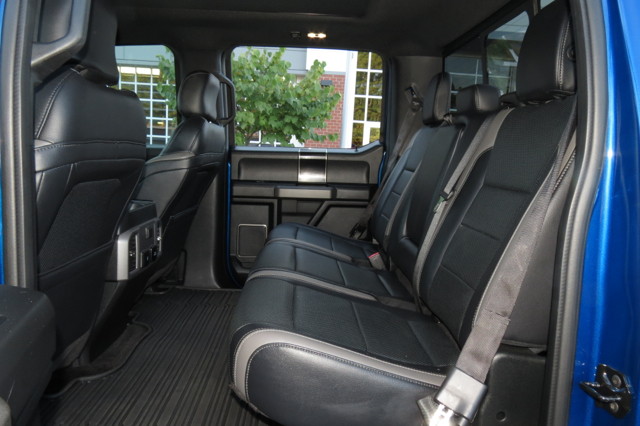 Whether you choose the Raptor SuperCab or SuperCrew, the front seating compartment is gigantic. Two very big bolstered, yet comfortable seats comprise the front compartment, which is split by an oversized center stack and console. That console is large and deep enough to hold a small cooler. You can also stuff inside your backpack, pocketbook or a day bag. 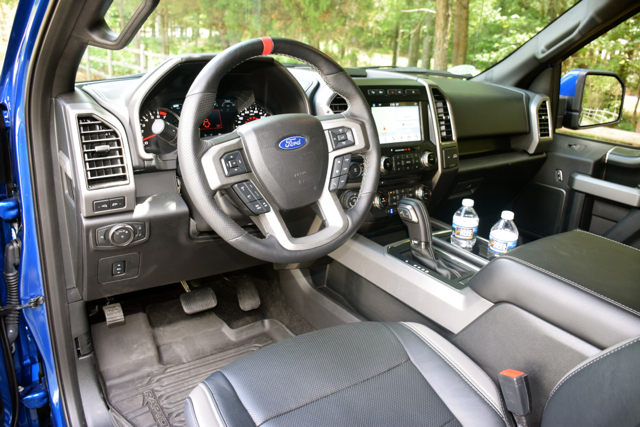 The list of standard features includes full power accessories, a power driver’s seat, a tilt-and-telescopic steering column, a leather-wrapped steering wheel, Ford Performance aluminum scuff plates and unique trim. If that’s not enough there are various package upgrades that add heated and cooled power front seats, leather seating surfaces, carbon fiber trim and dual-zone climate control. These are the features found in the Limited or Platinum trims. 6. Outfitted with today’s technologies. It can be frustrating to purchase a vehicle only to learn that certain technologies we take for granted are either extra cost add-ons or are just not available. Some European luxury makes charge $300 for an Apple CarPlay upgrade alone, while not offering Android Auto at all. Mainstream brands such as Ford “get it” and deliver the goods we want. The Raptor comes with front and rear power points (12 volts), USB ports, auxiliary audio input, front and back 110-volt-/400-watt power inverters and SYNC telematics. You also get a 7-speaker audio system, Bluetooth connectivity, the previously mentioned smartphone tools, satellite radio and a 4.2-inch display screen. Upgrades include an 8-inch touch-screen display as found in my test model. You can also opt for SYNC 3, which is a far superior and usable system than the base arrangement. An available 10-speaker B&O audio system raises the sound quality appreciably. 7. Safety is not secondary. The sheer size of the Raptor is a safety attribute insurers love. It can withstand a crash better than small car models, but this should never give drivers a false sense of security. Sure, you ride above the crowd and the look is intimidating, but when push comes to shove or metal comes into contact with metal, you’ll be glad that the standard safety features such as antilock brakes, stability and traction control, and an airbag suite are in place. By law, all vehicles built after May 1, 2018, must have a rearview camera. In the Raptor, Ford goes a step further by adding dynamic hitch assist to the camera system. The system helps line up the truck with the trailer from inside. It utilizes a black dotted line that adjusts when you move the steering wheel. A zoom button makes it easy to spot the hitch as it connects to the trailer. So, there is no need to leave the truck to check your connectivity progress, nor do you need a spotter to assist you. Other standard features include curve control, a post-crash alert system and a blind spot information system with rear cross-traffic alert. Driver-assist technologies are bundled under a Raptor Technology Package ($1,950). This package brings in rain-sensing wipers, automatic high beams, adaptive cruise control, lane keep assist and lane departure warning. 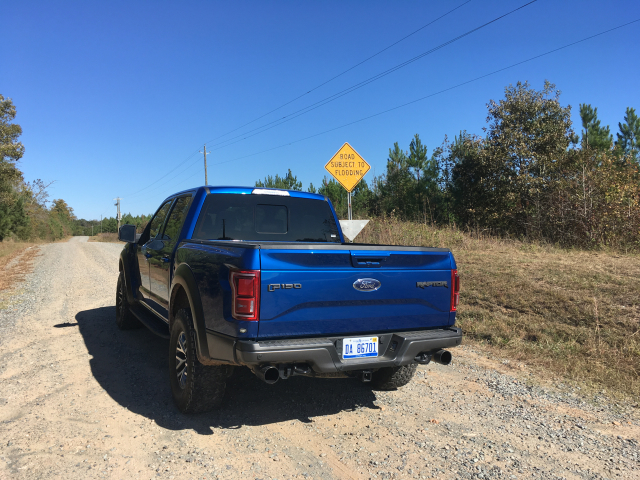 There are many other standard and available features with the Ford Raptor and they’re easy to overlook when you have a vehicle for a week or so as I usually do. For instance, on top of the hood is a large hood vent that’s fully functional. It expels heat from the engine, keeping it within an acceptable temperature range. You’ll find functioning front fender vents as well. 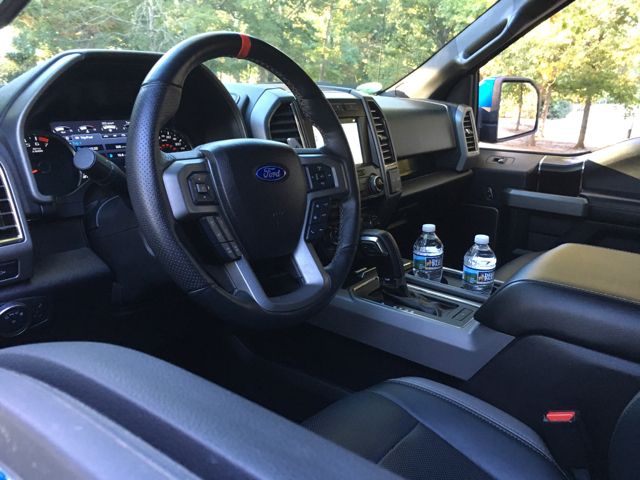 In the trunk bed, you’ll find an included box link or what Ford calls a “flexible, configurable universal pickup box interface system” that is useful for including such accessories as ramps, dividers and storage bins. 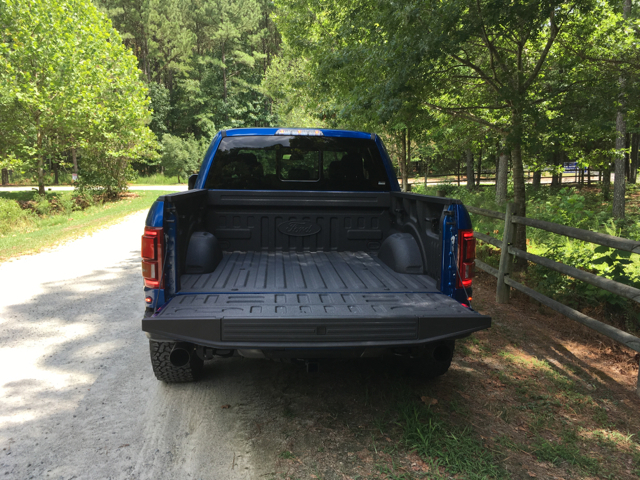 The available spray-in bedliner is a must for many truck owners. It came in useful when I had to take bulky items to the dump with no worry that I might scratch the bed’s surface. I also liked the FORD tailgate appliqué, which came with one of the two available equipment packages. The appliqué makes the same bold statement as the FORD block letters across the grille. My first time with the Raptor included much off-road travel. 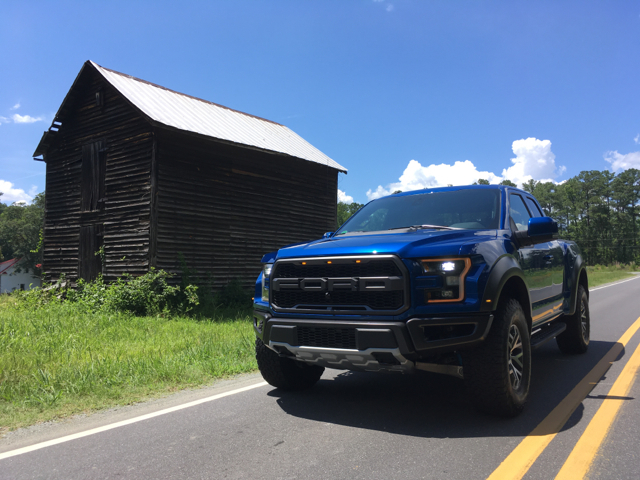 This time, I took the Raptor on lengthy road trips to better gauge its on-road prowess. Needless to say, I wasn’t disappointed. The Raptor simply never lacks for power. Move away from a full stop and this 5,500+ pound beast feels light on its feet (or wheels!). 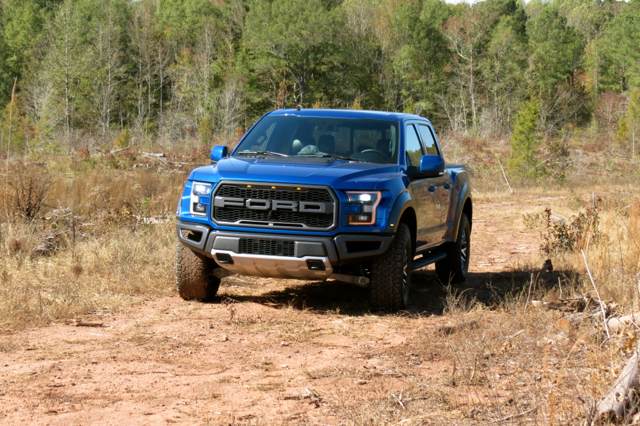 Some credit should be given to the aluminum-intensive body as that along with the lighter engine reduce its weight by 500 pounds from the previous Raptor. Initially, I was concerned how the 10-speed automatic transmission would work with the engine. It does just fine. In fact, it is entirely absent the gear hunting you may find on some powertrains. The transmission always seems to “know” which gear to deliver and does so without hesitation. Under full throttle the beastly side of the F-150 Raptor is apparent. The exhaust system bellows as the engine booms, which almost seems odd coming from a V6. One of my longer routes took me on roads that rose and fell with regularity. I found myself almost struggling to hold down my speed. 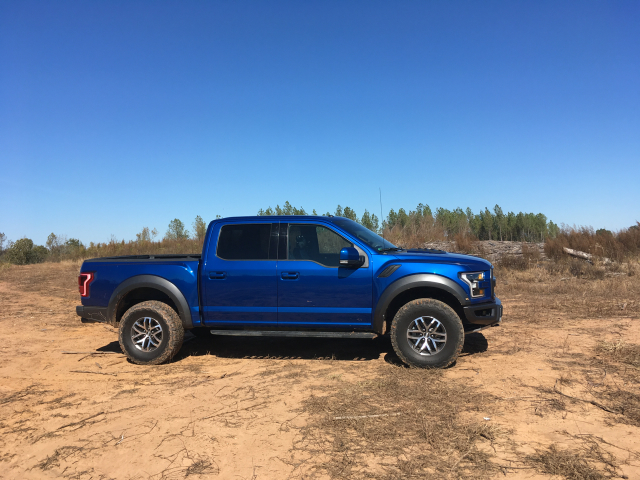 The ride is quite comfortable, the truck’s steering is spot on and the Raptor handles as well as you would expect any raised profile vehicle outfitted with big tires and sporting a brawny body should. The Raptor’s speed numbers are quite good, moving this truck from 0-60 mph in about five seconds. That’s faster than any truck on the market and quicker than many SUVs. The performance edge it has becomes apparent when off-roading, by means of its previously mentioned Baja mode. We’ve established that the F-150 Raptor is unlike any other pickup truck, including any other Ford model. Because it is in a league of its own, people who are seriously considering one will evaluate it strictly on its own merits. Manufacturers and brand ambassadors routinely hype products, and unless consumers are wary, they’ll fall for the pitches and may end up being disappointed if any of the claims fall short or are misunderstood. If there is anything about the Raptor that might give consumers pause beside the initial cost outlay, then fuel type and fuel consumption are two areas to keep in mind. With the former, you must use premium grade gasoline. With the latter, the Raptor makes an EPA-estimated 15 mpg in the city and 18 mpg on the highway. As for this driver, I averaged 15.2 mpg, covering 450 miles before my time with this amazing truck came to an end. A block letter applique makes a “can’t miss” statement. Raptor photos copyright Auto Trends Magazine. All rights reserved. Dissecting the most dynamic Ford Raptor ever. The second-generation Ford F-150 Raptor. Think “raptor” and the Velociraptor dinosaurs of the Cretaceous Period may come to mind. Just as easily, raptor also describes certain types of contemporary birds of prey, including eagles, hawks, and vultures. 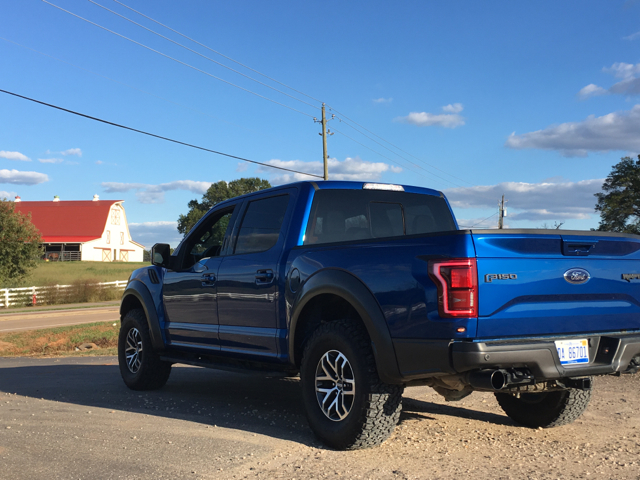 No matter, the “Raptor” appellation appended to the most powerful of all Ford F-150 models is entirely appropriate for describing a truck that is at once brutish, dapper, and simply fun to drive on- and off-road. To that end, we’ll dissect the most powerful of all F-150s by starting out with a look at its history. If you attended the 2008 SEMA Show, you may have been present for the unveiling of the 2010 Ford F-150 SVT Raptor. SVT or Special Vehicle Team was the name of Ford’s performance vehicle arm. SVT succeeded SVO — Special Vehicle Operations, eventually renamed Ford Performance. The original or first-generation Raptor is based on the twelfth-generation Ford F-Series. The first F-Series pickup truck debuted in 1948 as the F1, but it wasn’t until 1975 when Ford began using the F-150 designation. The original Raptor was the second performance truck from Ford, designed to surpass the SVT Lightning (last produced in the early 2000s) as Ford’s performance truck. That Raptor participated in Mexico’s famous Baja 1000 race before it went on sale to consumers. Initially, a 5.4-liter V8 engine generating 310 horsepower was offered, with a second engine — a 6.2-liter V8 generating 411 — joining the base engine. Both were mated to a 6-speed automatic transmission and offered SuperCab and SuperCrew configurations. The key to the this four-wheel drive F-150 is its seven-inch wider track with 11.2 inches of suspension travel up from and 12.1 inches at the rear. The suspension utilizes Fox Racing Shocks with internal triple-bypass dampers and a 4.10 rear axle. Production of the first-generation Raptor spanned five model years — 2010 to 2014. Ford brought out the current and thirteenth-generation F-150 in 2015. What they did not include among the many available grades was a new Raptor model. Likely, Ford was busy readying the aluminum-intensive F-150 and wanted to delay the Raptor to give it time to prepare the new model as well as the next-generation Super Duty. The current Raptor was introduced at an auto show in early 2015 before going on sale the following year as a 2017 model. When Ford designed the new Raptor, once again, they went with SuperCab and SuperCrew configurations. 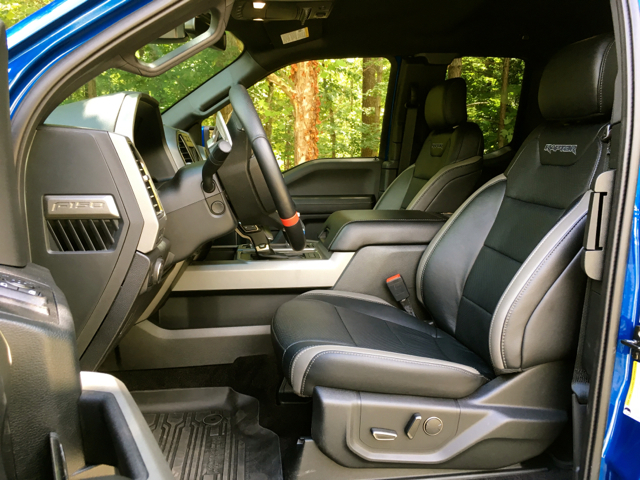 Although Ford still offers a regular cab, the Raptor is also about providing a large cabin. The current Raptor SuperCab sits on a 134.2-inch wheelbase, exclusive to this model. Its a foot longer than the regular cab’s wheelbase. Choose the SuperCrew and the wheelbase is stretched out by nearly a foot to 146 inches. Both models come with a 5.5-foot box bed. Overall, the SuperCab measures 220 inches long to the 231.9 inches for the SuperCrew. Both are 86.3 inches wide or 96.8 inches wide when including the mirrors. The Raptor is 78.5 inches tall and tips the scales at 5,525 pounds. Payload ratings are 1,000 (SuperCab) and 1,200 (SuperCrew) pounds; tow ratings are 6,000 (SuperCab) and 8,000 (SuperCrew) pounds. We already know about the two cab configurations and the box bed that comes with the 2017 Raptor. But there’s much more to this performance truck. Up front, a bold fascia is evident. As before, FORD block letters grace this truck, the only F-150 so adorned. Above the grille as well as on the front corners you’ll find LED marker lights. Activate the headlamps and the LED accent lights complete the Raptor’s menacing look. 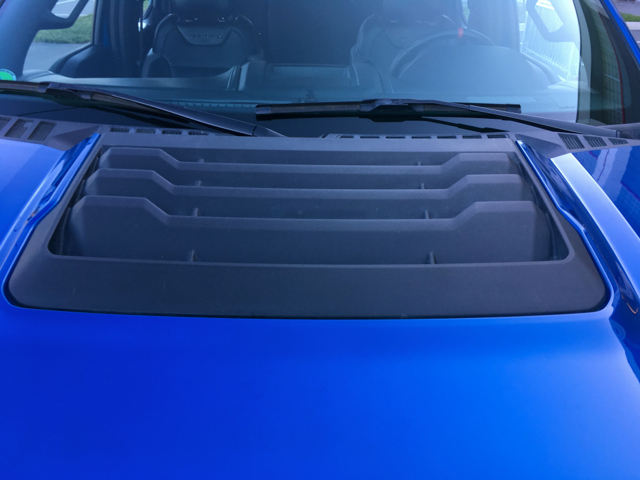 Cast your eyes on the hood and you’ll find functional extractors. Additional extractors are located on the flared front fender. Front to back the Raptor projects confidence and strength with its unique grille insert and surround, wheel lip moldings, cast aluminum running boards, front and engine skid plates, and the tailgate with LED lighting accents. You’ll also find a pair of tow hooks up front and another pair at the rear. There are four cargo box tie-downs too. As for the wheels, you may be surprised to discover that 17-inch cast aluminum wheels are standard. You can also upgrade to 17-inch forged aluminum bead-lock capable wheels ($1,195). Other upgrades include a tailgate step ($375), spray-in bedliner ($495) and a twin-panel moonroof ($1,295). Ford could have continued with its 6.2-liter V8 engine when considering its powertrain choices for the Raptor. As for the 5.4-liter V8, it was last used in the 2017 E-Series Cutaway — yes, that E-Series (which was once called the Econoline) lives on in commercial van form. Wisely, Ford looked at something else, an engine better suited for the now lighter F-150 Raptor: its own 3.5-liter twin-turbo (Ecoboost) V6 engine. 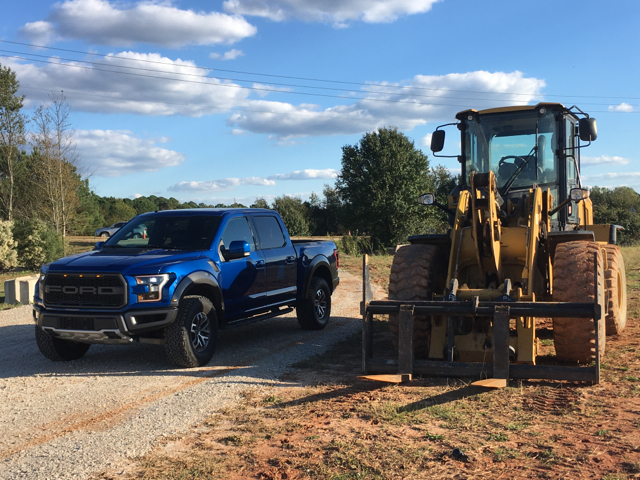 Ford’s Ecoboost line has done wonders for the automaker, allowing it to replace heavier and larger displacement engines with smaller, yet more powerful and efficient powerplants. But utilizing the current engine wasn’t enough. Instead, Ford began working on a high output version in an effort to provide more power and improve fuel efficiency. Not only that, the enhanced engine would work alongside Ford’s new 10-speed automatic transmission. The updates include an unusual direct and port-fuel injection pairing, stronger and lighter crank and valvetrain components, a modified turbo system with an electronic wastegate, as well as a remade valve train and oil pump. Other changes extend to the engine control calibrations, pistons, turbo compressors and the dual exhaust system. 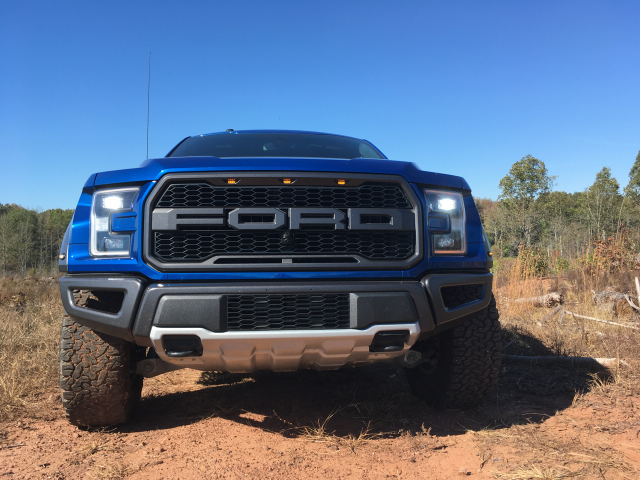 As a result of the changes, the 2017 Raptor packs 450 horsepower and an astonishing 510 pound-feet of torque. That’s up 39 horsepower and 31 pound-feet of torque respectively over the previous 6.2-liter V8 engine. Remarkable. By the way, that same high-output engine now powers the 2018 Lincoln Navigator. 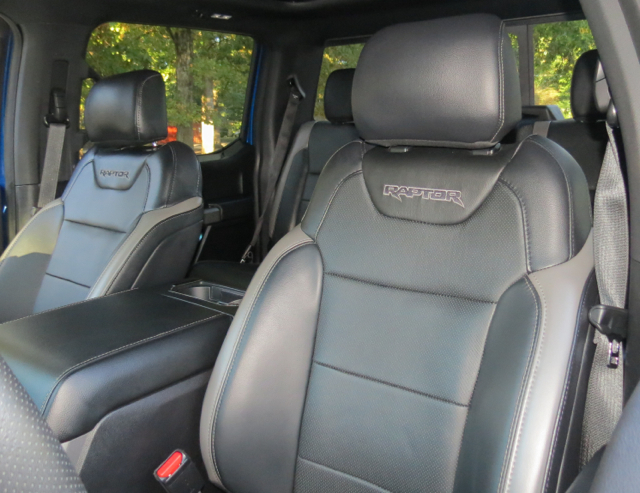 If you’re looking to maximize interior space, then the four-door SuperCrew is where its at. The SuperCab also has four doors, but the rear doors are rear hinged for ease of access/egress to the back compartment. 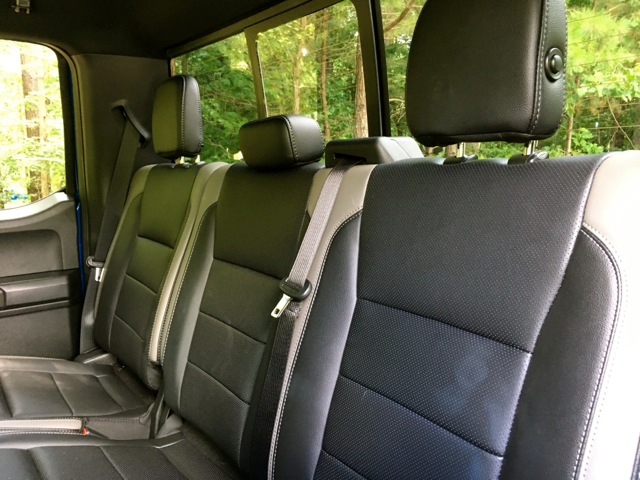 Seating is for five as all models have bucket seats up front and a 60/40 fold-up rear bench seat. 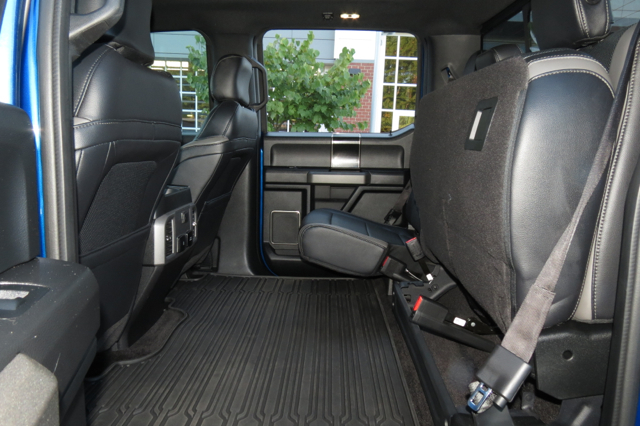 You’ll also find storage areas under the rear seat. 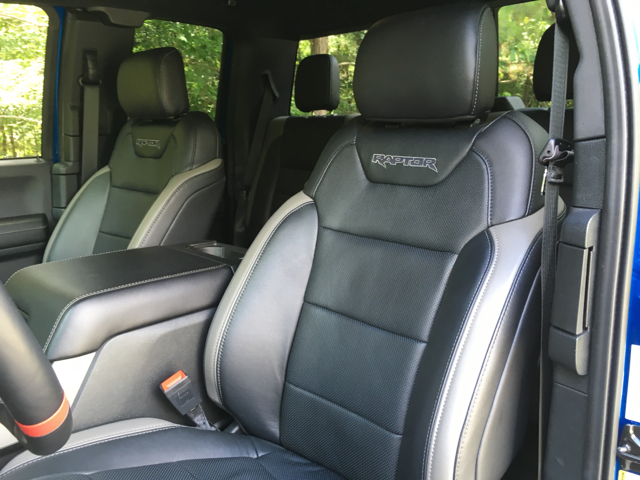 Seat surfaces are covered in special cloth trim; leather seats are available. The front seats are big and supportive. 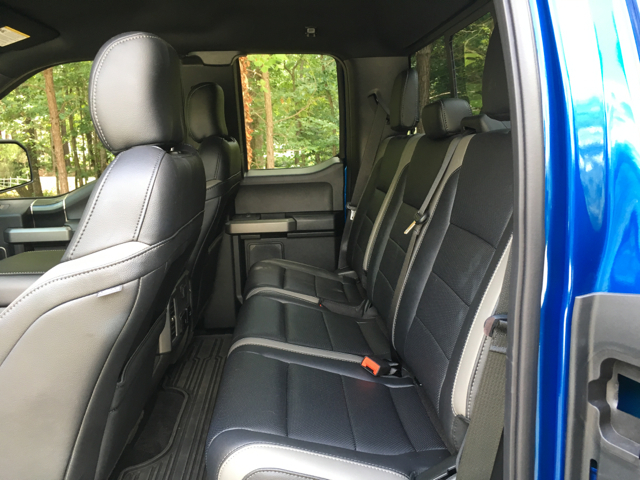 As for the rear seat, there are notable legroom differences between cabs — keep this point in mind when shopping for a Raptor. Standard features include full power accessories, a tilt and telescopic steering column, a leather-wrapped steering wheel, cruise control, magnesium paddle shifters (mounted to the steering wheel), and air conditioning. Optional equipment includes a heated steering wheel ($155). Shoppers can also choose one of two equipment groups. 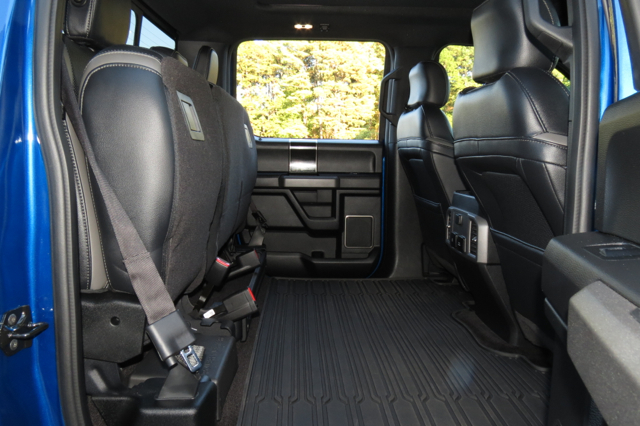 The 801A group ($3,160) brings in 10-way heated power driver and passenger seats with lumbar, leather-trimmed seats, power-adjustable pedals, and a power-sliding rear window. Choose the 802A Equipment Package ($9,345) and you’ll add a power adjustable tilt and telescopic steering column, heated and cooled front seats, inflatable rear safety belts, and dual-zone climate control. While much of the attention is on the Raptor’s on- and off-road prowess, we’d be remiss if we’d glossed over the truck’s many tech and safety features. The standard audio system is simple — six speakers with a CD player, satellite radio, and SYNC voice recognition with a USB port. 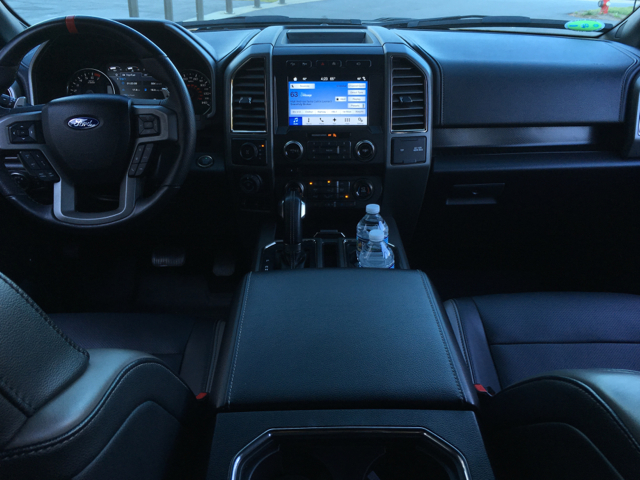 Upgrades include a 10-speaker Bose audio system with HD Radio, navigation and a SYNC 3 package with an 8-inch screen and additional USB ports. I like the latest SYNC package best — after two tries, this one makes the previous attempts forgivable. On the safety front, the Raptor has a rearview camera. Customers may upgrade to a 360-degree camera system, which uses sensors to map out a “surround view” of the truck. It is part of a technology package that includes a lane keeping system. Other driving assist systems include blind spot information, trailer sway control, and adaptive cruise control. Here’s something very important to know about the 2017 Raptor: you can use it as your daily driver. This is important for one big reason: a pickup truck is about utility and to provide anything less means customers aren’t about to invest at least $50,000 for a sport truck. This means the Raptor offers a comfortable ride thanks to a compliant suspension and BF Goodrich KO2 tires. 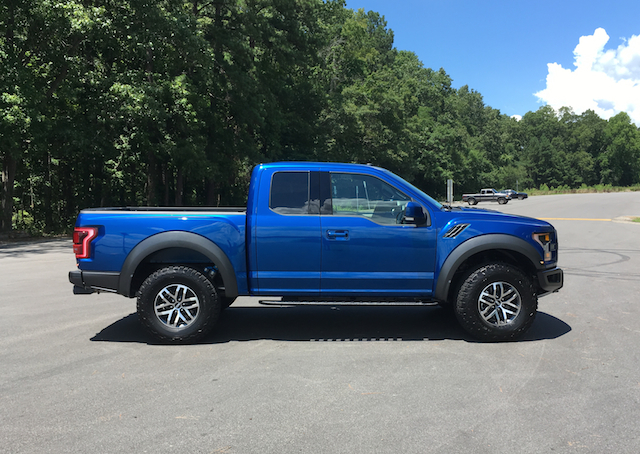 The all-terrain tires were built with the Raptor in mind, therefore they’re specially constructed to offer the best blend of on-road comfort and off-road durability. That said, Raptor fans have mostly off-roading in mind and who can blame them? This model is destined for trails, rock outcroppings and everywhere else where paved surfaces are not found. Here are some important numbers to keep in mind when off-roading: ground clearance measures 11.45 inches at the base of the running boards, with a water fording depth of 32 inches. The approach angle is 30.2 degrees, the break over height measures 13.6 inches, the break over angle is 22.9 degrees (SuperCab) or 21.8 degrees (SuperCrew), with a departure angle of 23.1 degrees. Rear axle clearance is 9.88 inches. My off-road antics meant staying local, instead of joining the many people taking in the last of the fall foliage leap peeping in the mountains some four hours to the west of me. It turns out my favorite high-terrain haunts had their first snow of the season. Oh, to combine mountain navigating with driving on slick, icy roads! Instead, a destination one hour south of me had to do — that’s where a handful of retired lumber trails beckoned me. Most hadn’t been used in a year or two, which meant they were still passable and the new growth hadn’t taken over. As soon as I set the Raptor’s front wheels on the first trail, I switched to four-wheel drive, selecting 4-High. Once engaged I moved forward, picking up speed as I gauged the trail ahead. With a top speed of 20 to 25 mph, I raced on at a fairly steady clip, pushing through and over brush, slamming through puddles, while keeping my eyes peeled for wildlife. Just five minutes later I reached my first major clearing where the trail crossed a utility line. That’s where I switched to 4A, a new setting combining four- and all-wheel drive. In other words, this unique arrangement distributes more power to the front wheels as needed, reducing throttle response, while boosting traction and stability control intervention. That was just right for the muddy trail ahead and I was not disappointed. During most of my trail trekking, I stayed on even ground. On occasion, I eased the Raptor over a forgotten log and continued on. 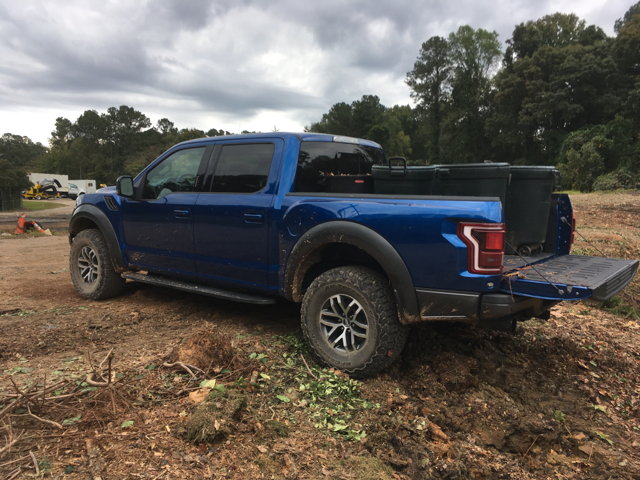 There was one area where I knew I could put the Raptor through its toughest paces, but I declined — too overgrown (who knew what might be lying underneath) and I was by myself. The last thing I wanted was for my story to turn into a dreaded and dismal rescue effort. Oh, did I forget to mention on-road performance? This beast of a pickup truck certainly gets it done, traveling from 0-60 mph in just 5.3 seconds and completing the quarter mile in 14.1 seconds according to Road & Track. Similar numbers were recorded by Motor Trends. Matching your all-out speed is a deep booming exhaust note, which resonates through the twin exhaust pipes. Given that much of your driving will be on macadam, these are important points of note. Figure that you’ll pay way above the Raptor’s $50K starting price. The reason is simple: all the goodies (i.e. convenience features and safety items) are equipment group upgrades. Certainly, you could do without them, but in all likelihood you won’t. Is $65,000 too much to pay for an F-150? You’re already there if you’re considering the Platinum four-wheel drive grade. And based on Ford data for pickup truck sales, F-150 customers continue to opt for the costlier trims, often matching their choices in luxury models. We’d be negligent if we didn’t add another tidbit about Ford’s Raptor. Specifically, this beast has the attention of aftermarket folk who look at the truck and think of ways to deliver more power or their own special take on what this model could be. At the top of this list is Hennessey Performance, known for tricking out models from Acura to Nissan. Ford products have benefited too, including the Focus RS, Mustang and GT. 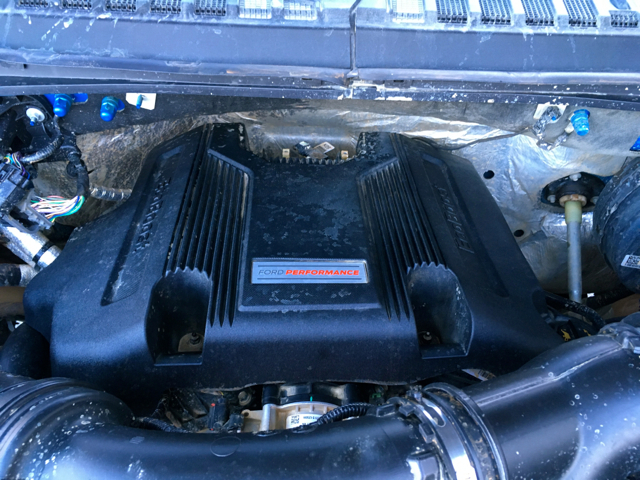 Even before Ford released its second-generation Raptor, Hennessey cobbled together a 2015-2016 VelociRaptor, adding a supercharger to Ford’s 5.0-liter V8 engine, delivering 603 horsepower (650 horsepower with the larger supercharger). For the 2017-2018 Raptor, the VelociRaptor has returned and there are no less than three variants available. The one that caught our attention was the 6×6 model, a $295,000 concept with 6×6 locking rear axles, an upgraded Fox suspension, 20-inch wheels set within off-road tires, and other special touches. 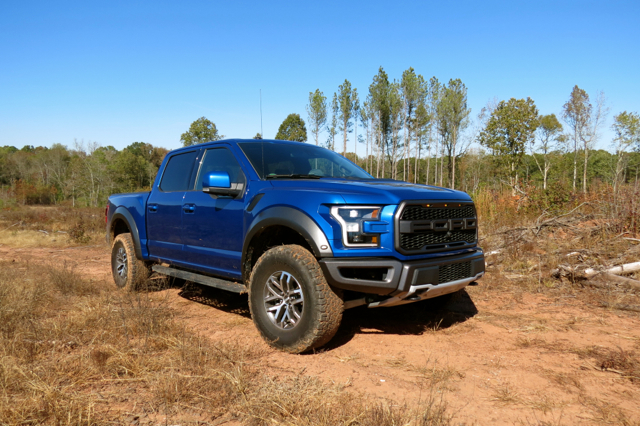 It utilizes the same 450-hp engine in the stock Raptor or customers can choose a twin-turbo upgrade to boost performance above 600 horsepower at a cost of $22,500. Although technically a “concept” you can have one custom made by Hennessey Performance. So, what are you waiting for? For about $300K, this 6×6 VelociRaptor can be yours.